"A basic rule of ethics is that just because you can do something—in this case, eradicate a harmful species through advanced technologies—doesn't automatically mean you should do it," said study co-author Michael Paul Nelson, professor and the Ruth H. Spaniol Chair of Renewable Resources in OSU's College of Forestry. "A project like this requires rational ethical discourse." Most at risk of contracting sleeping sickness, which is nearly always fatal if not treated, are those in remote rural areas dependent on agriculture, hunting and fishing—areas with limited access to adequate health care. Without a vaccine, officials are focused on controlling the tsetse fly. "Numerous elimination programs have been established across Africa, many under the umbrella of PATTEC: the Pan African Tsetse and Trypanosomosis Eradication Campaign," Nelson said. "Recently, Ghana, Burkina Faso, Mali, Uganda, Kenya and Ethiopia were involved in the first phase of PATTEC. 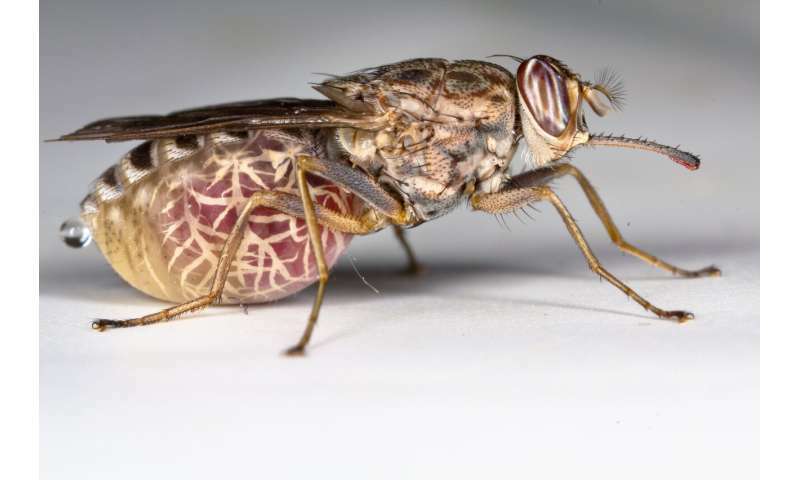 Other countries, including Senegal, Zimbabwe and Botswana, have also successfully eliminated tsetse flies from part of or their full territory using sources of funding other than PATTEC." Nelson and study co-author Chelsea Batavia, who recently completed a Ph.D. in the College of Forestry at Oregon State, say the ethical aspects of intentionally wiping out the family's 31 species must be considered despite the significant harm the flies cause to humans. "You really need to weigh arguments built around two different types of values of the species at local and global scales: instrumental values and intrinsic values," Nelson said. A species' instrumental value refers to its "utility or function as a means to an end." It can also refer to "disvalues," aspects that detract from human well-being, such as the tsetse fly's role as a disease transmitter. "In practical terms, we can compare instrumental values and disvalues by calculating the relative benefits and costs associated with a species," said Batavia. "Strict utilitarian logic would suggest it's appropriate to pursue elimination programs whose total benefit exceeds total costs." But these utilitarian calculations aren't so simple. Would there be consequences for protected areas—i.e., would tsetse fly eradication increase human and animal encroachment inside or near animal preserves, protected forests, etc.? And those are just questions dealing with the instrumental values. The ethics become more complex when the tsetse flies' intrinsic value is brought into the equation. "It is important to consider intrinsic value as a separate type of value rather than attempting to weigh it against instrumental values," Batavia said. "And complete and intentional eradication of a species is pretty tough to justify, once we recognize that species as a bearer of intrinsic value." "We suggest localized elimination represents a defensible compromise as long as it's enacted with due restraint and harm to tsetse flies is minimized," Batavia said. "We suggest tsetse flies have intrinsic value, and certain obligations follow from that proposition; but we definitely don't want to forget that human beings have intrinsic value as well. So we propose elimination techniques that are diligently, cautiously and selectively applied to those fly populations actively compromising human communities can appropriately promote the welfare of human beings, who are bearers of intrinsic value, while also acknowledging the intrinsic value of tsetse fly species." This is the exact opposite of the White Saviour trope when it comes to Africa. This is rich Americans telling poor people that the fly is worth more than they are. Eliminating a blood-sucking fly that spreads a deadly disease that KILLS PEOPLE is "unethical"? Oh don't be STUPID! Its just a very stupid but dangerous and unpleasant fly; nothing "unethical" about making THAT creature extinct! The same goes for making the malaria spreading mosquito. Would these morons also say making the rabies virus extinct is "unethical"? "...The same goes for making the malaria spreading mosquito extinct." ""A basic rule of ethics is that just because you can do something—in this case, eradicate a harmful species through advanced technologies—doesn't automatically mean you should do so." -So then, basically, doc, we shouldn't have eradicated smallpox. Correct? "intrinsic value of tsetse fly species..." -And let us not forget the intrinsic value of the polio species. "Michael Paul Nelson, is an environmental scholar, writer, teacher, speaker, consultant, and professor of environmental ethics and philosophy at Oregon State University... He is a collaborator with, and the philosopher in residence for, the Isle Royale Wolf-Moose Project in Lake Superior..."
-Heres looking forward to the time when the last formal philo is eradicated from the earth. Ah, but you've done the old switcheroo at the end there. You aren't just talking about wiping out malaria and trypanosomosis, you want to wipe out the tsetse fly and mosquito. Yet when it comes to rabies it's the virus you want to go after not the dogs, cats, skunks, raccoons, bats, and whatever other terrestrial mammalian carnivore/omnivore species that can serve as vectors of the disease globally. Yet when it comes to rabies it's the virus you want to go after not the dogs, cats, skunks, raccoons, bats, and whatever other terrestrial mammalian carnivore/omnivore species that can serve as vectors of the disease globally. For various reasons, we generally wouldn't want to eliminate mammals, even those that sometimes spread deadly disease. To eliminate mammals to stop the spread of deadly disease would generally be considered to be too drastic and unacceptable. But I have no 'ethical' problem eliminating a stupid FLY that spreads disease; To eliminate a fly to stop the spread of a deadly disease would generally be considered perfectly acceptable. Big difference. A fly, at least purely in terms of brain power, would be generally considered to be a much 'lower' life form than a mammal. Feh. Tsetse flies are nasty; but don't go spraying the whole damn forest over them. A larger discussion is needed, so valuable input. Personally I cannot see much intrinsic value in species from diverse clades where more or less identical replacements will eventually evolve; insects used to be such (but even they are hit by AGW!) and flies are one of the more diverse clades. The relative value in mammals/big brains/long lived organisms vs insects/small brains/mostly short lived organisms is another and opinionated, often religious, discussion. The goal must be to eliminate the parasite, if that means vector extinction is not primary. Dunno if the paper consider that.